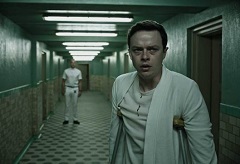 A mash-up of pretty much every lunatic asylum movie ever made, A Cure for Wellness is the lavishly filmed if laborious new horror from Pirates of the Caribbean director Gore Verbinski. Dane DeHaan stars as ambitious young corporate exec Lockhart who is dispatched to a remote Swiss spa where his boss has seemingly disappeared - only to discover something far more terrifying at the hands of Jason Isaacs' sinister doctor, Volmer. Beautifully filmed by cinematographer Bojan Bazelli the movie is an enthusiastic if hopelessly overlong and ill-focused blend of psychological thriller and gratutiously gory horror, but it does at least offer superb British composer Benjamin Wallfisch to go all-out with his opulent score, as is often the case with Gothic chillers. By and large Verbinski has shown good musical instinct in his movies from Alan Silvestri's charming Mousehunt to the stirring, if controversial, Pirates of the Caribbean trilogy. As a movie A Cure for Wellness skews closest to his 2002 remake of The Ring, which had an effectively creepy score from Hans Zimmer, and it's not a surprise to see Wallfisch follow suit. From his days as an orchestrator for Dario Marianelli on the acclaimed likes of Atonement through his own diverse works on films such as Dear Wendy and this year's Oscar-buzzed Hidden Figures (along with Zimmer and Pharell Williams), Wallfisch has emerged as one of Britain's most accomplished film composers, one who puts emphasis on symphonic power and melody. He's also one who is increasingly prolific in the realm of horror: last year he scored the ghoulish low-budget hit Lights Out and he's just recently been signed up to the remake of Stephen King's IT. 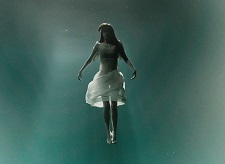 Little wonder: Wallfisch draws on the classic Christopher Young/Jerry Goldsmith approach of anchoring his more dissonant and challenging musical ideas around beautiful, haunting main themes; A Cure for Wellness is no exception. Everything is anchored by an archetypal horror piece 'Hannah and Volmer', the first half of which is a classic vocal lullaby for actress Mia Goth's mysterious central character, performed by boy soprano Sebastian Exall, which hints at the darkly lurid secret lurking at the heart of the storyline. The second, string-led piece is for the evil Volmer himself. Reminiscent of classic themes from the likes of The Innocents and Rosemary's Baby, the former piece in particular breathes its way through the score. By and large this is a score of two halves, the opulent, enveloping majesty of the first steadily given way to the darker, more chaotic second. The lullaby theme makes an attractive, alluring appearance in 'No-One Ever Leaves' before a sepulchral choir leads it down ever-creepier avenues whilst 'Bicycle' ushers in new textures: surging strings, bass and choir that have the appropriately expansive feel of a vast location; as vast in fact as the Alps in which Lockhart finds himself. The Gothic quality of the vocals is enhanced in 'The Rite', a track that positively drips with brooding intrigue and an almost ecclesiastical fervour before the latter half picks up with an unsettling string waltz, not to dissimilar to what the aforementioned Hans Zimmer did with his terrific score for Hannibal. One of the score's highlights comes in the thunderously powerful 'Feuerwalzer', a stirring adaptation of Hannah and Volmer's themes that reaches wonderfully wicked heights of decadence. 'Magnificent, Isn't It', by contrast, reduces the theme down to a glacial, eerie glockenspiel and vibraphone arrangement, teasing at an answer to the mystery that's lurking just out of reach. 'Actually I'm Feeling Much Better' is the first action/suspense track in the score, resonating through a bass-heavy string section, vocals, cymbals and tastefully gauged synthetic textures to really give a sense of urgency. The following track 'Clearly He's Lost His Mind' veers in completely the opposite direction, choral glissando and scratchy acoustic effects giving a palpable sense of unease, although it eventually leads into a sumptuous piano-led version of the main theme. Influences of a different, but no less delightful, kind come in the synthetically enhanced 'Our Thoughts Exactly', a captivating blend of bubbly electronic undercurrent and rich string section; imagine John Carpenter meets Christopher Young and you're not too far off. There's a diverse, compelling array of marimbas, glockenspiel and vibraphone on offer in 'Volmer Institut', the acoustics of which sound watery and expansive (a clever way of alluding to one of the film's key plot points). Moments of long-awaited, explosive savagery come in 'The Terrible Darkness', the brutally overwhelming 'Lipstick' and 'There's Nothing Wrong With You People': harsh synthetic eruptions, rumbling piano and discordant strings writhing and twisting in the manner of the eels that feature so prominently in the film's storyline. The all-too-brief 'Waiting' calms everything down with more chilled-out marimba rhythms; one senses Wallfisch is, quite brilliantly, replicating the approach of Volmer's institute, the music by turns calming and horribly invasive. 'Zutritt Verboten' sandwiches a violent timpani assault between deceptively calming layers, putting the listener on edge. Everything then comes to a pensive, somewhat inconclusive resolution in 'Lockhart's Letter' and 'Volmer's Lab', the churning orchestrations and synths still tainted with that air of mystique as one is forced to contemplate the divide between sanity and madness. By reinstating Volmer's theme in the latter track Wallfisch cleverly suggests that the character's evil influence will go on, before one final vocal performance of Hannah's theme rounds everything off. The final track is an ironic, spaced-out take on the Ramones' 'I Wanna Be Sedated' performed by Finnish singer/songwriter Mirel Wagner. 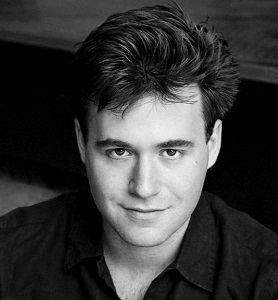 It's exciting and heartening to note the rapid ascent of a composer like Benjamin Wallfisch over the past few years. He's clearly someone who possesses a keen dramatic instinct, understanding of an orchestra and the requisite versatility to hop between various genres with ease. For the purposes of this review it's fabulous to note his increasing confidence within the realm of horror: as both Lights Out and now A Cure for Wellness prove, Wallfisch is able to use both melodic and harmonic constructs to engross the listener in a captivating, Gothic soundscape. Never resorting to tired 'stinger' cliches but always developing his ideas in intelligent fashion, Wallfisch has crafted a horror tapestry that is both creepy and listenable, a difficult feat to pull off. Fingers crossed he can demonstrate these chops in all manner of genres in the coming years. 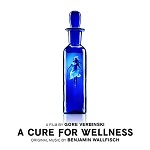 Benjamin Wallfisch's score album for A Cure for Wellness is available from these links at Amazon.com and Amazon.co.uk. And as a taster here is a link to the Milan Records Featurette video of the score introduced by the composer: Benjamin Wallfisch - A Cure For Wellness Featurette.